Only ten J Class yachts were built before the Second World War stopped the movement in its tracks, but in the last 20 years these magnificent sloops have made an incredible comeback. Why has the J Class remained irresistable? David Glenn explains. One of the most awe-inspiring sights in modern yachting is the Spirit of Tradition fleet blasting off the start line at the Antigua Classic Yacht Regatta. It happens every year at the end of April. Chances are it will include at least two J Class yachts, hitting the line on the gun at full tilt, exploding through the cobalt blue Caribbean rollers at anything up to 12 knots as they charge upwind. Watching Velsheda, Ranger, Shamrock V and Endeavour will bring a lump to your throat, such is the emotion generated by these beautifully proportioned 130ft racing machines with their carbon rigs driving 170 tonnes of steel, aluminium and teak towards the weather mark. It’s heady stuff. Watching them is one thing; racing quite another matter. 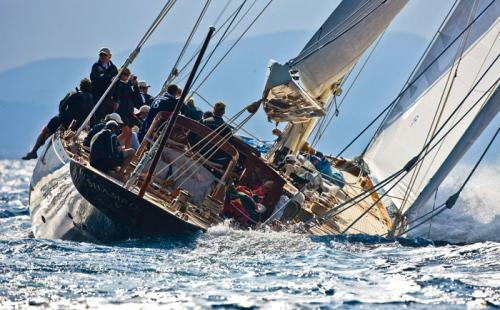 In 1999 I was aboard the rebuilt Velsheda, taking part in the Antigua Classic Regatta. I had a single task as part of a four-man team – to tend the forward starboard runner. Nothing else. “Let that go once we’ve tacked and the whole rig comes down,” warned skipper Simon Bolt, as another wall of water thundered down the leeward deck and tried to rip me from the winch. Dressed in authentic off-white, one-piece cotton boiler-suits, which had to be worn with a stout belt “so there’s something to grab if you go overboard”, they were tough, adrenaline-filled days out. God knows what it was like up forward as massive spinnakers were peeled and headsails weighing a quarter of a tonne were wrestled to the needle-sharp foredeck as the bow buried itself into the back of yet another wave. Sometimes you daren’t look. But with the race won or lost, back on the dock the feeling of elation, fuelled by being part of the 36-strong crew aboard one of these extraordinary yachts, triggered a high like no other. You knew you were playing a role, no matter how small, in a legendary story that began in 1930, was halted by World War II and then defied the pundits by opening another chapter 20 years ago. Today with five Js in commission, all in racing trim, and at least two more new examples about to be launched, the J Class phenomenon is back. Why is the J Class so popular? Why does a yacht with an arguably unexciting performance – they go upwind at 12 knots and downwind at 12 knots – costing £20 million to build and demanding eye-watering running costs, seem to be burgeoning during the worst recession since the class was born? 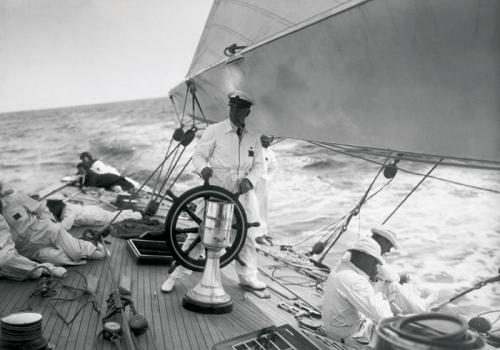 There is no single answer, but you only have to look back to the 1930s and the characters that owned and raced the Js on both sides of the Atlantic, sometimes for the America’s Cup, to understand why the class occupies a special place in yachting history. Underlying everything is the look of the J Class. It seems to transcend any change in yachting vogue, displaying a timeless line with outrageous overhangs and a proportion of hull to rig that is hard to better. They possess true elegance. There is no doubt that captains of industry who want to flex their sporting muscle have been drawn to a class which only the very rich can afford and there are distinct parallels between J owners in the 1930s and those of the past 20 years. The difference is that in the 1930s owners liked to shout about their achievements and hogged the pages of national newspapers. Today, they are as quiet as mice. The J Class emerged in 1930 and marked a quantum leap in yachting technology, but comprised a hotchpotch of design altered over many years. The J Class – so named because it was the letter allocated to its particular size by the Universal Rule to which the yachts were built (K and M Class yachts were, for example, shorter on the waterline) – emerged in 1930 and marked a quantum leap in yachting technology. The so-called Big Class, which flourished in the UK in the 1920s, was impressive, but comprised a hotchpotch of design altered over many years. Yachts like King George V’s Britannia, built in 1893 as a gaff-rigged cutter but converted in the 1920s to Bermudan rig to rate as a J, Candida, Cambria, White Heather and schooners like Westward were even larger and more expensive to run. But as the greater efficiency of the Marconi or Bermudan rig became apparent their days were numbered. One catalyst for the J Class itself was legendary grocer Sir Thomas Lipton’s final crack at challenging for the America’s Cup in 1931. He did so under the Universal Rule with the composite, wooden-planked, Charles E. Nicholson-design Shamrock V.
It was the 14th challenge since 1851 and the Americans, despite the withering effects of the Great Depression, reacted in dramatic fashion, organising their defence with four syndicates, each bulging with millionaires, putting forward separate Js: Enterprise, Whirlwind, Weetamoe and Yankee, which apart from Enterprise had already been launched. Key to the American effort was the remarkable Harold Vanderbilt of the New York Yacht Club, who had inherited fabulous wealth from the family’s railroad companies, making him one of the country’s richest men. Brought up on the family’s Idle Hour estate on Long Island Sound, he was a keen and accomplished sailor, and he used American technology and teamwork to build a far superior J in Enterprise. The defence completely overwhelmed Lipton’s effort. The British press castigated Lipton’s lack of preparedness and old-fashioned attitude. Vanderbilt, who among other things is credited with inventing contract bridge, left no stone unturned. “Mr. Harold Vanderbilt does not exactly go boat-sailing because summer is the closed season for fox-hunting,” stated an acerbic critic in the British yachting press. A look at the huge gap between the British and American J Class tactics and designs in the early years of the America’s Cup. In the early days there was a yawning gap between the way the Americans and British approached the Cup and, for that matter, how they ran a yacht. Revolutionary metal masts, Park Avenue booms to improve sail shape (the British copied this American design with their ‘North Circular’ version), bronze hulls that needed no painting, superior sails, and campaigns that cost £100,000 even in those days, blew away the Brits. Lipton had spent just £30,000 to build and equip Shamrock. In the second Cup challenge in Js, in 1934, Sir T. O. M. Sopwith’s first Endeavour, also designed by Nicholson and equipped with wind instruments designed by her aircraft industrialist owner, nearly won the Cup, snatching defeat from the jaws of victory after leading the series 0-2. Sopwith was also up against Vanderbilt, who this time sailed Rainbow, which many considered to be the slower boat. But the British campaign was hobbled by a pay dispute – Endeavour’s crew got £5 a week but they wanted a raise for ‘going foreign’ – and the campaign approach was again brought into question when the first thing to be stripped off the yacht when they won a dispute over reducing weight was the bath! Back in Britain, the 1935 season proved to be the zenith of J Class and Big Class racing, although by the end of it the Js were under the cosh for their tendency to lose masts. Five went over the side that year and Endeavour II, launched with en eye on the next Cup challenge, lost hers twice. There was added spice in the competition off the shores of the UK with the arrival of the American J Yankee, now owned by millionaire and Listerine businessman Gerard Lambert, who enjoyed sparring with the Brits. But even Yankee lost her mast and the press rounded on the class for being dangerous and wasteful! That wasn’t enough to stop Sopwith, whose tail had been extracted from between his legs following the last defeat in Newport: Endeavour II was towed across the Atlantic in a veritable armada that included the first Endeavour. The British yachts found themselves up against the most advanced sailing machine the world had ever seen – Ranger, dubbed ‘the Super J’. Vanderbilt was the man to beat again. Not only had he bankrolled the entire defence as American business remained beset by a struggling economy, but he used highly scientific means to perfect design. The brilliant naval architect Starling Burgess, who had designed for Vanderbilt throughout the 1930s, was now aided by the equally brilliant but considerably more youthful Olin Stephens. Between them they finally selected ‘model 77-C’ from six tank tested. The yacht was considered ugly by some and not a natural to look at, but Vanderbilt’s team trusted the science (still the difference between the Americans and the Brits) and Ranger with her bluff or barrel bow and ‘low slung’ counter was the result. She proved to be dynamite on the race course and Endeavour II didn’t stand a chance. She was beaten in five straight races by large margins. The Americans and Vanderbilt had done it again. War then brought an end to an extraordinary era in yachting. Only ten J Class yachts were built to the Universal rule and not a single American yacht survived. Most were scrapped for the war effort. In any case, the American way was to discard the machine once it has served its purpose. In Britain they faired a little better, and some Js were mud-berthed on the East and South Coasts. 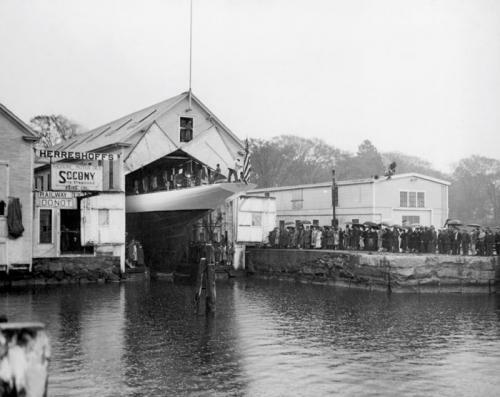 Two survived in the UK: Velsheda, originally built by the businessman who ran Woolworths in the UK (W. L. Stevenson named her after his daughters Velma, Sheila and Daphne), but which never challenged for the America’s Cup; and Endeavour, saved by becoming a houseboat on the Hamble. Shamrock ended up in Italy and survived the war hidden in a hay barn. Seemingly resigned to the history books, the J Class was made a triumphant return in the 1980s. In his seminal book about the J Class, Enterprise to Endeavour, yachting historian Ian Dear predicted in the first edition in 1977 that the likes of the Js would never be seen again. By the time the fourth edition was published in 1999 he was quite happily eating his words! The American Elizabeth Meyer was, without doubt, instrumental in bringing the class back to life when in the 1980s she extracted what was left of Endeavour from a amble mud-berth, began rebuilding her in Calshot, and then moved her to Royal Huisman in Holland, who completed the restoration superbly. With the transom of the original Ranger mounted on a bulkhead in her saloon, Endeavour is still regarded as one of the best-looking and potentially fastest Js. She was owned briefly by Dennis Kozlowski, the disgraced tycoon who ran Tyco, who famously said: “No one really owns Endeavour, she’s part of yachting history. I’m delighted to be the current caretaker.” Unfortunately he ended up in prison and the State of New York became Endeavour’s ‘caretaker’ before they sold her to her current owner, who has kept the yacht in the Pacific. She’s currently being refitted in New Zealand. Ronald de Waal is a Dutchman who until recently was chairman of the Saks Group in the USA and has made a fortune in clothing. He has dedicated a lot of time to improving Velsheda over the years since he had her rebuilt by Southampton Yacht Services to a reconfigured design by Dutch naval architect Gerry Dykstra. Ronald de Waal steers the yacht himself to great effect and has had some legendary tussles with Ranger, the new Super J built in Denmark for American realestate magnate John Williams. The rivalry between the two is fierce and even led to a collision between the yachts in Antigua last year. But Velsheda would have been lost had it not been for British scrap-metal merchant Terry Brabant who saved her from a muddy grave on the Hamble and famously sold his Rolls-Royce to cast a new lead keel for the yacht. With very little modern equipment he sailed her hard in the Solent, chartering her and crossing the Atlantic for a Caribbean season, all without an engine! Without Brabant’s initiative Ronald de Waal wouldn’t have what he has today. Shamrock V is owned by a Brazilian telecommunications businessman Marcos de Moraes who had the yacht rebuilt at Pendennis Shipyard in Falmouth in 2001. He tends to keep away from the race course but with a number of events being planned in the run-up to the 2012 London Olympics he might be tempted back. The latest new J to launch, Hanuman, a modern interpretation of Endeavour II, has recently entered the racing fray. She was commissioned by serial yacht owner Jim Clark (Hyperion and Athena), the American who brought us Netscape and Silicon Graphics, and who remains a colossus in Silicon Valley. Hanuman, named after a Hindu deity, built by Royal Huisman and designed by Gerry Dykstra, has had no expense spared when it comes to rig and sail wardrobe. Last year she beat Ranger in the Newport Bucket but in March this year she lost out 2-1 to the same boat at the St Barths Bucket. 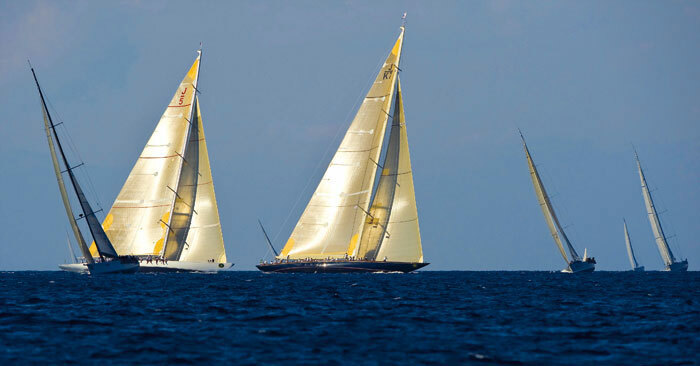 They were due to meet again with Velsheda at the Antigua Classic Yacht Regatta in April. Another Dutchman, property developer Chris Gongriep, who has owned a number of yachts including Sapphire and Windrose of Amsterdam, has given the go-ahead for a new version of Rainbow, which is well advanced in Holland at Freddie Bloesma’s aluminium hull fabrication yard. The yacht, reconfigured by Gerry Dykstra, will be in the water in 2011 with a full-on race programme. About to be launched is Lionheart, the biggest J so far, redesigned by Andre Hoek and built in Holland by Claasen Jachtbouw, after an extensive research programme. Unfortunately, her owner’s business commitments mean that he won’t be able to enjoy the fruits of this project – she’s for sale with Yachting Partners International and Hoek Brokerage. What an opportunity to join a class with such a remarkable history and one which looks destined to run and run!